Jason Momoa, Will Smith & Madelaine Petsch are tackling the YouTube generation. After Deadline broke the news congresswoman and social media sensation Alexandria Ocasio-Cortez was skipping Sundance, the last minute appearance by Aquaman himself, Jason Momoa, saved the day. 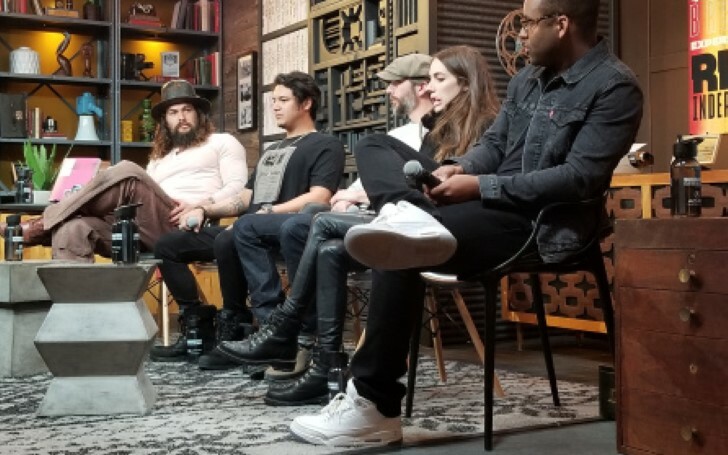 Momoa particularly visited Utah for the snowboarding however he was also the signature panelist at YouTube’s “What Works, What Doesn’t: Meet The Creatives Behind Some of YouTube’s Buzziest Channels” tonight, alongside the YouTube channel strategists for Will Smith and Riverdale's Madelaine Petsch. Additionally, Momoa’s social media posse for his On the Roam YouTube channel were in tow. The discussion on how younger and older generations have ignited fans on the social media channel, and balanced organic promo stunts with privacy came under overall conclusion: Just wing it, and be yourself. Momoa, who launched On the Roam in sync with his global Aquaman tour to stoke fans said he didn’t "have a clue of what they (YouTube viewers) want" and "didn’t want to change what they need". Additionally, the actor didn't shy away about how green he was with the social media platform, leaving his YouTube shoots to director/editor/DP Etienne Aurelius and producer Brian Mendoza. Furthermore, the Aquaman actor took fans behind the scenes of his Discovery Channel/Netflix series, Frontier. It, however, was a different story for Riverdale actress Petsch, as Youtube changed her public image, which many Riverdale fans mistook for her nefarious alter ego character, Cheryl Blossom. “In the first season, Cheryl was an entitled spoiled brat. Madelaine’s Instagram was huge and she was getting millions of followers, but they would comment, ‘OMG, how could you kill your brother? How could you be mean to Betty?'. "Having Petsch respond to fans with humorous and funny reactions didn’t work. But launching a YouTube channel “flipped the script for us how she talks to her fan base. It’s a venue for Petsch to show her true, affable self, with stunts such as cooking alongside and getting yelled at by Gordon Ramsay, and making vegan cinnamon rolls." One of Smith’s most notable stunts to date was in response to a social media group called the Yes Theory, which never accepts ‘no’ to challenges. They propositioned the Suicide Squad star to heli-jump (bungee jump) out of a helicopter. It was a stunt which took the Fresh Prince of Bel Air out of his comfort zone. One video even yielded 19.5M views, but Smith posted a series from the death-defying act. Fortner will put her clients through a series of questions to see just what they prefer. Primarily, Fortner and Petsch discussed the actress giving a YouTube tour of her house which later was switched to a tour of her on-set trailer which was a safer bet, and more authentic to her daily working routine. “They’re in full control of what their privacy level is. Ultimately, they’re now more comfortable” explained Turner about the Smiths. “I love sharing parts of my family and being a father,” says Momoa who last week showed fans his Iowa state family, “but it has to go through the boss.” And the boss is wife/actress Lisa Bonet.